Do you struggle to relate the Bible to your daily life? Jane Herring wrestled with the contradictions, puzzling stories, and difficult sayings in scripture—until she discovered the power of interacting with them. Herring guides you to talk back to those scripture passages you don't understand. Ask questions, explore your life, plead, praise, and ponder. She provides simple, practical tools for beginning and experienced writers. 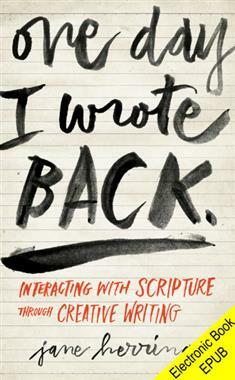 A perfect resource for individuals, small groups, and retreats. Length of study: 6 weeks. Includes Leader's Guide.